We come to you for your brake repairs Auckland Wide 24/7.Worn brake pads? Problems stopping? We are provide professional brake repairs and servicing needs Auckland wide 24/7! A Metal-on-metal sound when braking: This can occur when brake pads or shoes are worn away. Driving with this condition may cause damage to other car components such as disc rotors or drums as well as be potentially dangerous. Brake pedal is soft when pumped: Or, if it gets harder when pumped, there may be air within the car’s brake lines, the Brake pedal slowly sinks to the floor or the car pulls to one side when braking, Pulsing when braking at high speeds and Smoking brakes and with a burnt rubber smell. Brake repairs are important and should not be overlooked. When Brakes that are are worn or squealing call Auckland mobile mechanics for fast, convenient service, and we will come to you!. For emergency roadside assistance call 0508 247 273 for assistance! If your car is having any of the above Brake Problems it’s time to have your car seen to immediately for safety of yourself and others. Our fully qualified mobile mechanics are happy to come to you, whenever you need them and at a convenient location in Auckland suburbs, 7 days a week 24 hours a day and Roadside Assistance. Our specialist technicians bring a fully equipped van with a large range of parts and tools needed to get your car working and safely back on the road again. 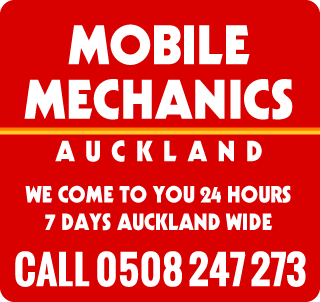 Auckland Mobile Mechanic technicians are professional reliable mechanics and work to the highest standard.